From dental assisting to office administration, Amy Scoggins has incredible dental and customer service knowledge. Her dedication to her work, colleagues, and patients earned her a 2016 scholarship to the AADOM Conference as well as the prestigious Patterson Dental Diamond Scholar award. This is Amy’s story! In Shelby, North Carolina, Cornerstone Dental Associates attracts patients from across Cleveland County. Providing a big-city dental experience with a local touch has kept patients coming back for generations since the 1960s. For the past 20 years, Amy Scoggins, Cornerstone Dental’s office administrator, has played an important role in that continued success. 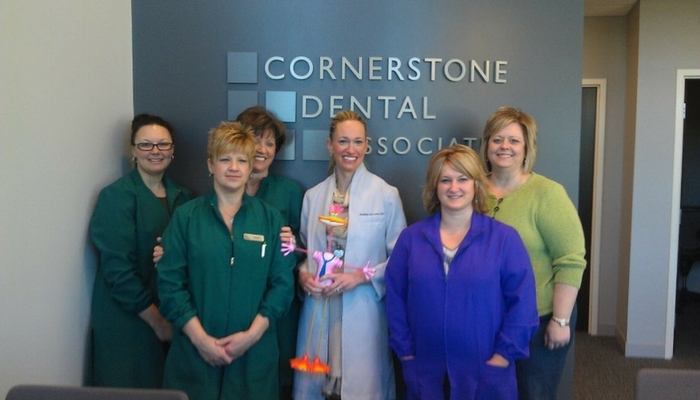 Amy is pictured alongside fellow Cornerstone Dental Associates team members as they prepare to volunteer with the “Give Kids a Smile” program. To say Scoggins wears many hats is an understatement. On any given day, she takes on human resources responsibilities for the 21-employee practice, assists with billing and coding questions, files insurance claims, oversees collections, helps with treatment coordination, and a variety of other roles. “Every day is a little different,” Scoggins said. She began her career as a dental assistant, so she is able to communicate with team members and patients easily. It’s one of the skills that has helped her build trust. 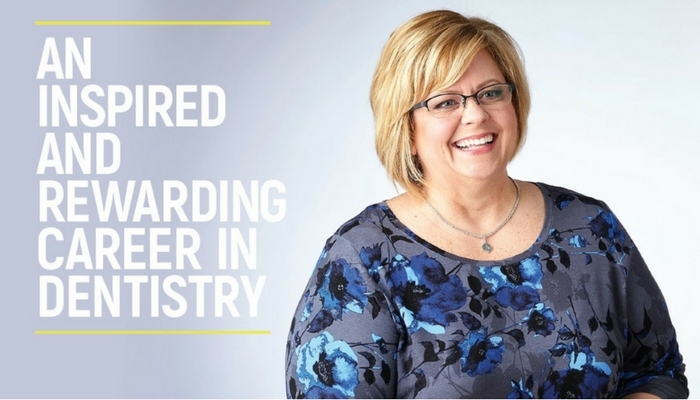 “I worked chairside for the first part of my career, 12 of those years at Cornerstone, so I really got to know the technical side of dentistry and the practice,” Scoggins said. She became well versed in the technology and equipment being used and became a valued partner for the new doctor when ownership switched hands. The transition from dental assistant to office administrator was a smooth one for Scoggins. Her knowledge of the traditional and existing practice infrastructure helped her make informed and confident recommendations to the doctor. Her expertise was especially handy when they moved to a new, state-of-the-art LEED Silver certified building – the first in Cleveland County – in 2009. 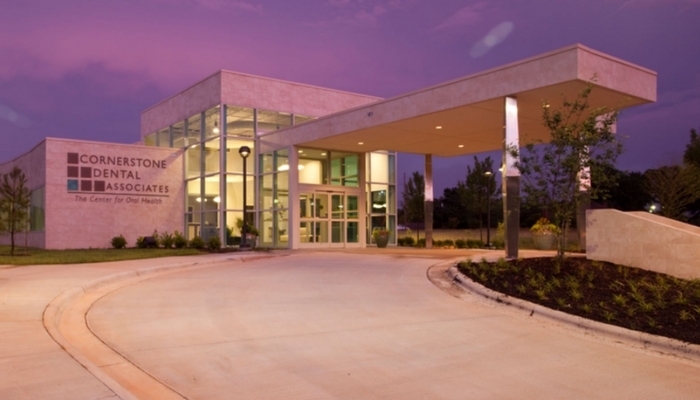 Cornerstone Dental Associates’ LEED Silver certified building, located in Shelby, North Carolina. And when it came time to choose new equipment, technology, and products to outfit the new office, Scoggins again stepped up with recommended solutions. “I believed in and trusted Dr. Lutz-Craver’s vision for the practice, and I wanted it to be as successful as she did,” Scoggins said. A few years into her new role as office administrator, Scoggins started thinking about how she could further expand her skills to accommodate the growing needs of Cornerstone. One Monday morning, the opportunity she was looking for walked in the front door. “Our Patterson rep, Matt Trexler, comes in every Monday morning, and one day he handed me an AADOM flyer. I didn’t know much about the organization, but I decided to try it out for a year and see what it was like,” Scoggins said. She didn’t just try it out, though. Scoggins began frequently using her membership as a resource. With a mission statement of “education, empowerment, and community,” linking up with AADOM was a natural fit for Amy Scoggins. “The member forum is so useful because you get a diverse range of opinions and experiences about everything related to dental practices,” Scoggins said. 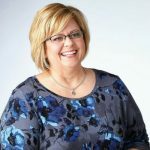 “I used it to consult with other office administrators when we were looking to bring on an in-house financing option for patients, and those conversations helped us make a better decision.” She also attended local education sessions and webinars that increased her knowledge and expanded her office management network. Impressed with her growth and looking for an opportunity to recognize Scoggins for her hard work, the doctors of Cornerstone tracked down a Patterson Dental scholarship nomination form for the 2016 AADOM conference in Boca Raton, Florida. 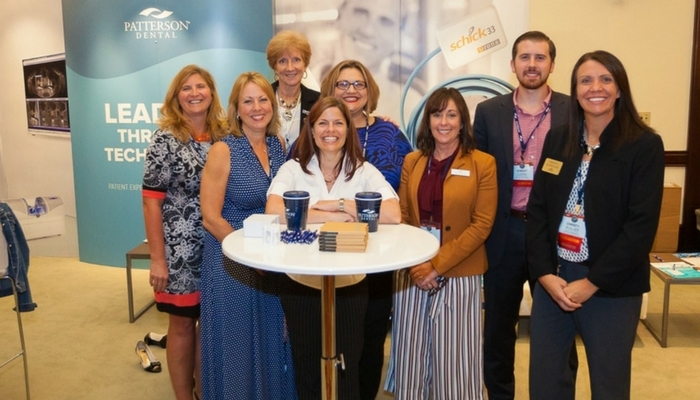 A group of Patterson team members is pictured alongside fellow attendees and presenters at the 2016 annual AADOM conference in Boca Raton, Florida. “Amy is a go-getter and such a huge reason our practice is where it is today,” wrote Dr. Sara Karner in her nomination of Scoggins for the scholarship. Karner highlighted Scoggins’ close involvement with the practice’s technology implementations, her unwavering commitment to excellent customer service, and her positive rapport with the entire Cornerstone team. “I had no idea she had nominated me for a scholarship, but on my birthday in June, I got an email notifying me I had won,” Scoggins said. 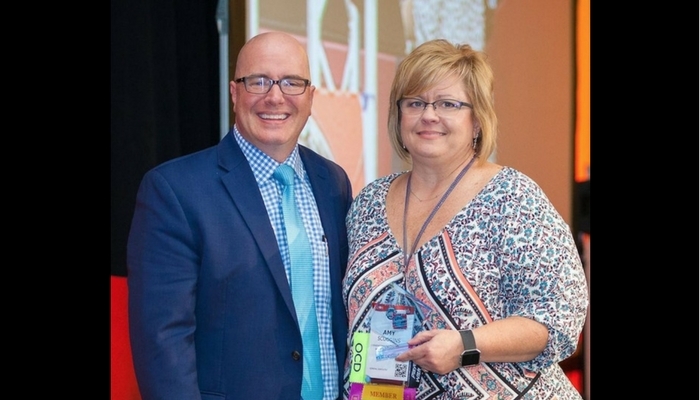 As a first-time attendee, Scoggins was in for a remarkable and rewarding experience. She met countless other office management professionals, attended in-depth education sessions, and further expanded her network of support. “I soaked up everything I could like a sponge,” Scoggins said. A personal favorite session was about medical billing and what dental professionals need to know to bring it into their practices. The surprises didn’t end there. Scoggins was also awarded the 2016 Patterson Dental Diamond Scholar award, an award given to an office management professional who demonstrates exceptional commitment to their work and consistently goes above and beyond. “It was such a shock to win the award, but I was really honored to have been chosen,” Scoggins said. Amy Scoggins is pictured alongside Richard Lake, Patterson Dental’s equipment marketing manager, after accepting her Diamond Scholar award in 2016. With a memorable AADOM Conference experience behind her, Scoggins is already making plans to attend the next one. “Everything from start to finish was phenomenal. I can’t wait to go to Scottsdale in 2017,” Scoggins said. 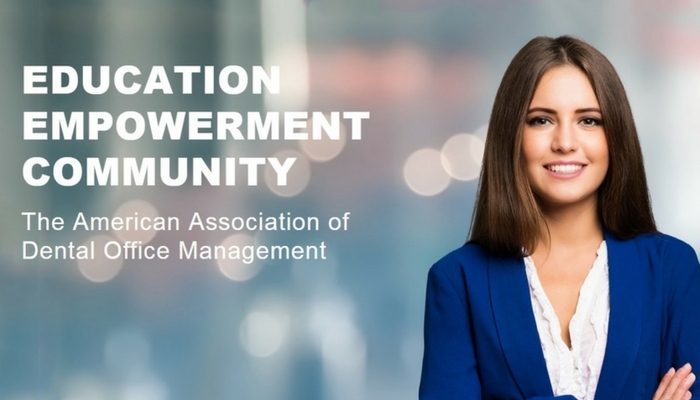 Patterson is proud to once again provide scholarships to office managers to attend the annual AADOM conference, which will be held in Scottsdale, Arizona this September. Complete this application form to nominate yourself or an office manager by July 7, 2017! This article originally appeared in the first issue of Best Practice Magazine, the newest publication by Patterson Dental. 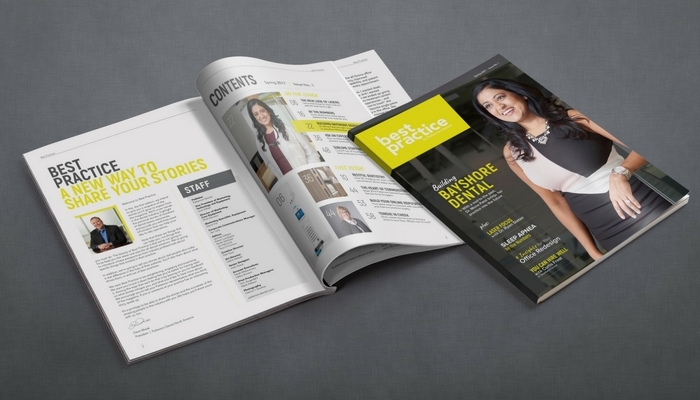 Best Practice features profiles on dental industry personalities, ideas for improving the look and feel of your practice, in-depth overviews of industry events, practice management tips, and more. If your practice didn’t receive the inaugural issue, visit our site here and click “request publications” to make sure you don’t miss out on the next one – it’s free to Patterson customers! The first issue of Best Practice Magazine, Patterson’s re-imagining of legacy publication Patterson Today, came out in April of 2017. Update: As of March 2017, Amy parted ways with Cornerstone Dental Associates to begin work as an independent dental management consultant.